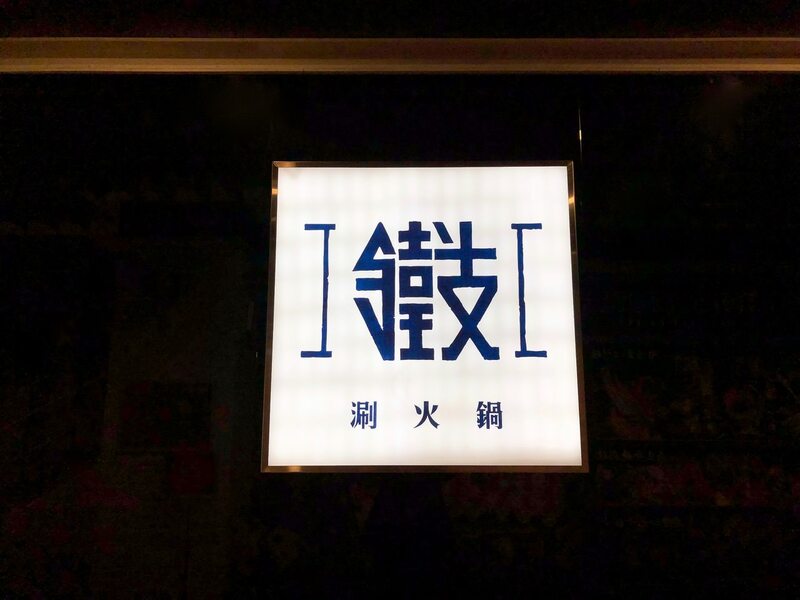 位於台北 Neo 19 的鐵支火鍋全名為”鐵支涮火鍋信義旗艦店”, 也是微風南山和信義華納威秀附近的餐廳之一. 這次有這個榮幸可品嚐到鐵支火鍋的極品海陸雙人套餐. 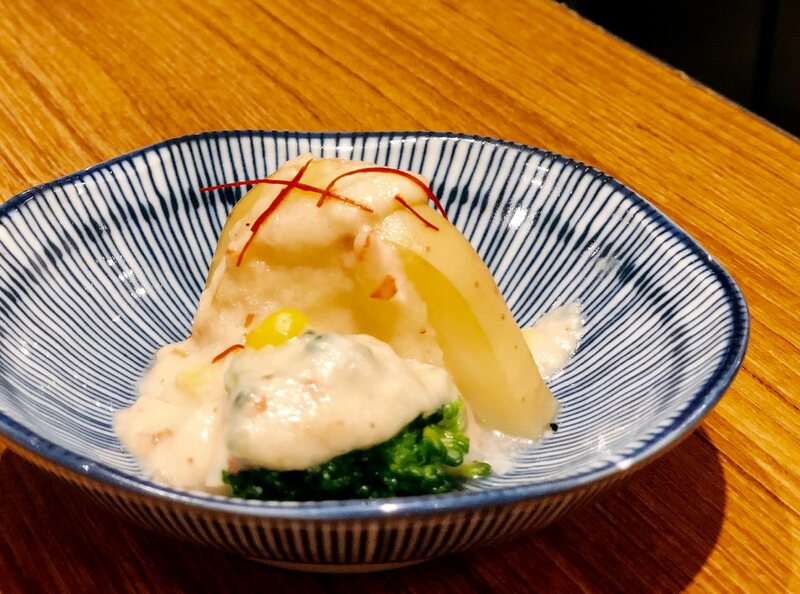 TIGI Hot Pot is one of the Neo 19 Restaurants. 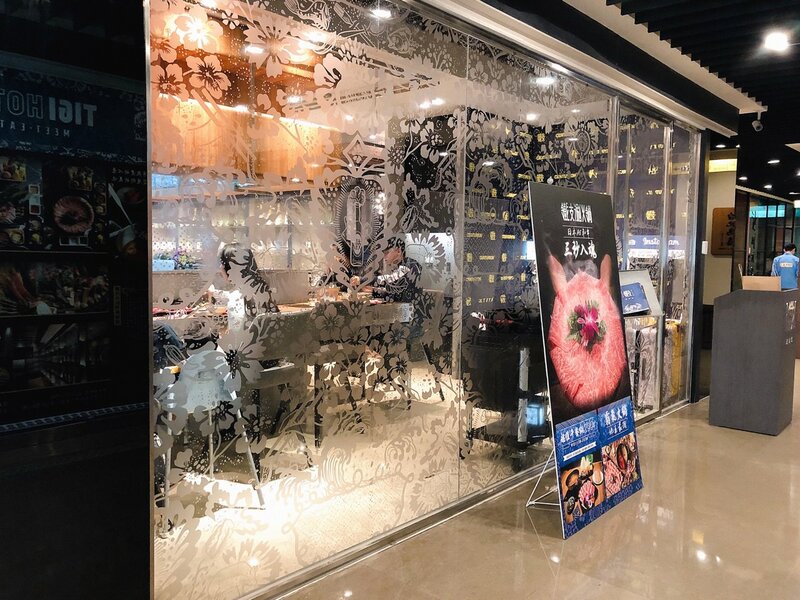 The restaurant is also near Nanshan Breeze and Xinyi Viewshow Theater. I have the opportunity to try out their Deluxe Surf and Turf Set for 2 People. 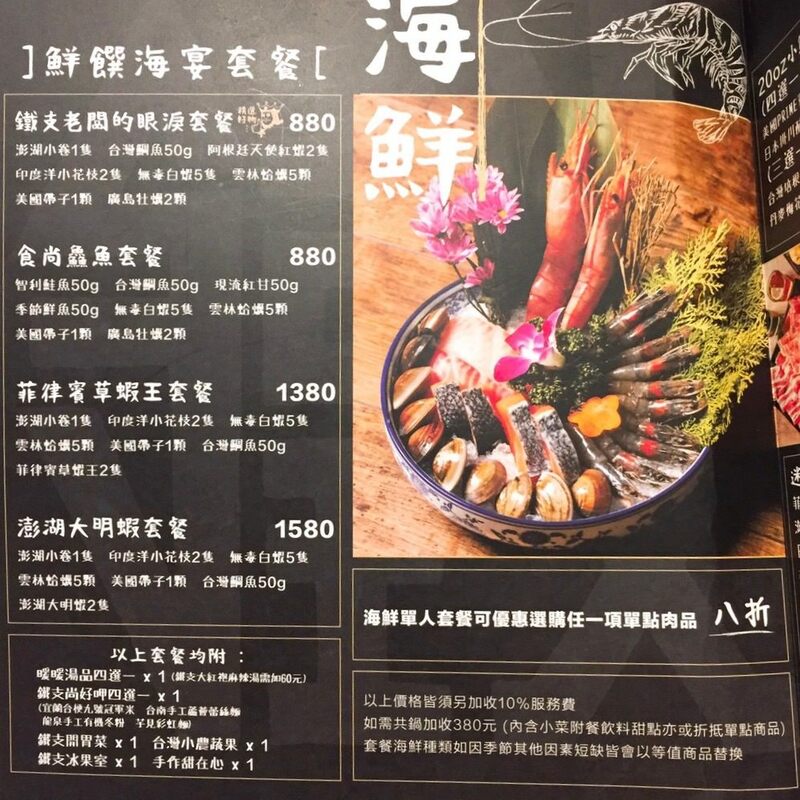 鐵支火鍋餐廳位置靠近象山捷運站一號出口, 因此餐廳鐵支火鍋有兩個入口, 一個入口是靠近松仁路, 我則是從 Neo 19 裡的門進去. 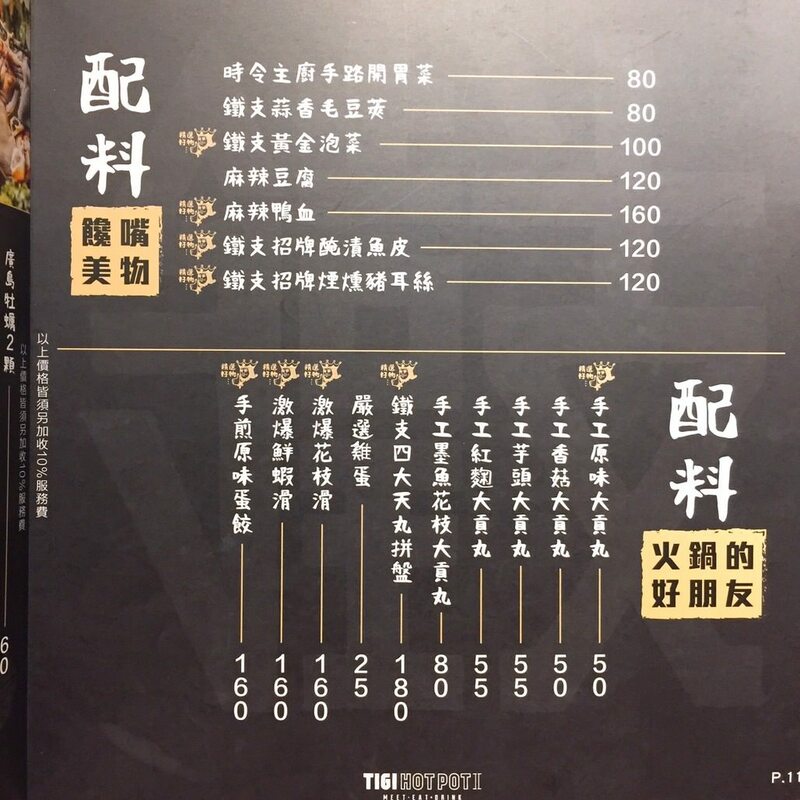 Neo 19 一樓餐廳有 “鳥喜”, “LA Pho” 和 “一幻拉麵” , 進入餐廳先入目的是半開放式廚房, 其他火鍋餐廳都是將廚房作為封閉式, 看不到廚房內部 , 也看不到廚師們, 鐵支火鍋餐廳的廚師們皆穿著日式職人制服, 單人寬敞座位就像高檔日本料理 (例如 “山花割烹”)板前座位. TIGI Hot Pot restaurant location is near Exit One of Elephant Mountain MRT station. Therefore, there are two entrances, one is inside Neo 19, and the other one is near Songren Road. 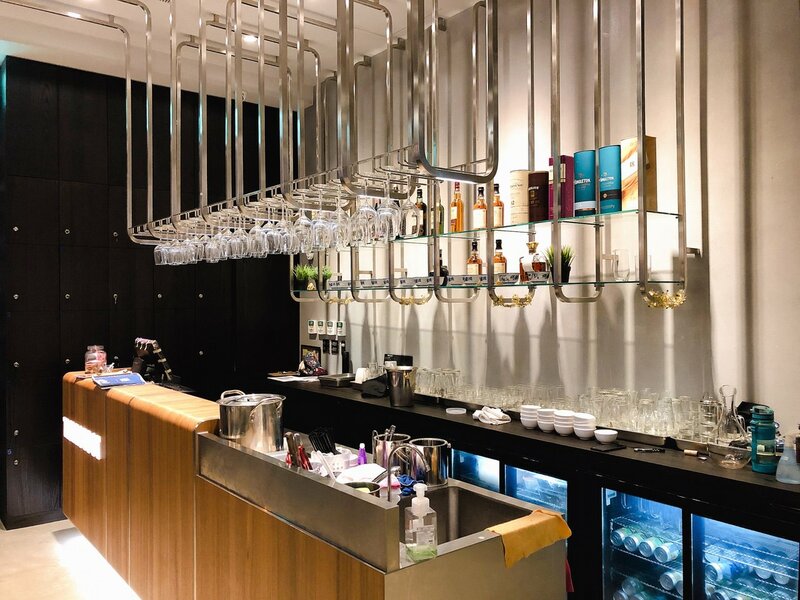 There are also three other restaurants in Neo 19 first floor – “LA Pho” , “produced by Toriki“, and “Ebisoba Ichigen Ramen”. 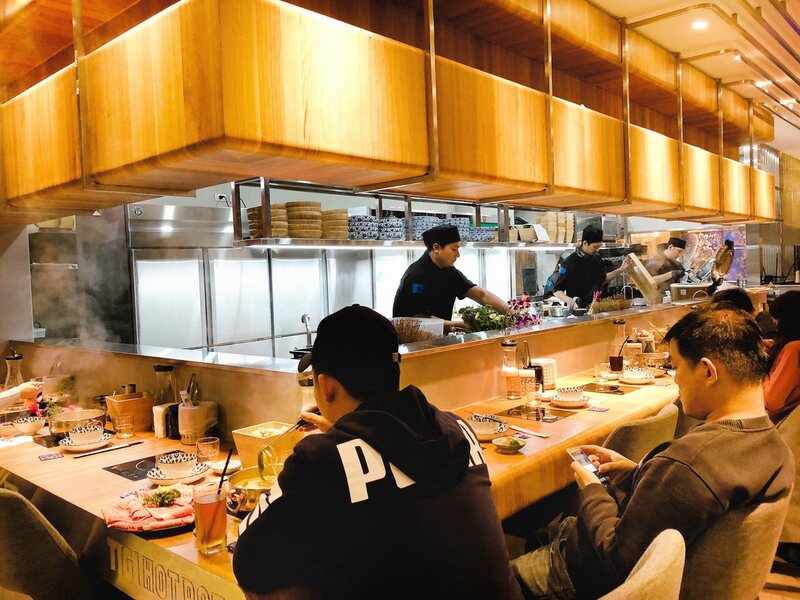 Unlike other hot pot restaurants, you can clearly see the TIGI Hot Pot Kitchen and its chefs. 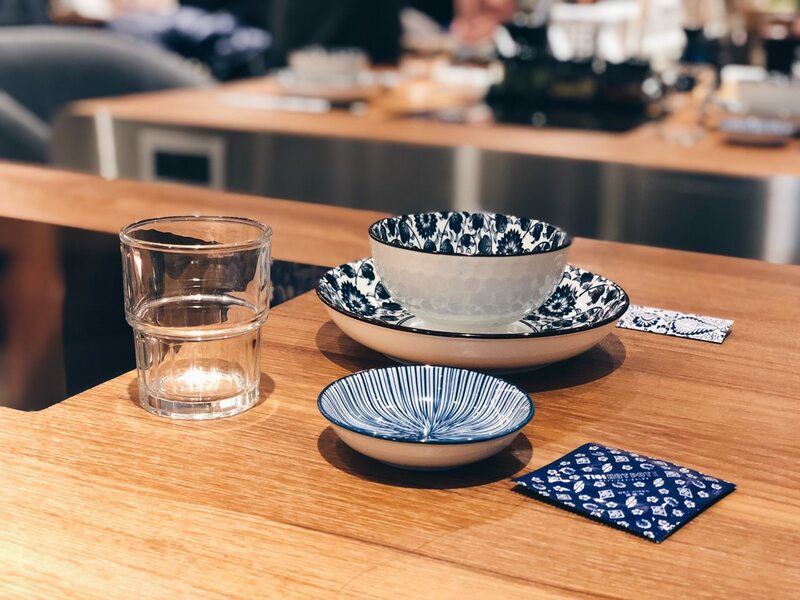 The counter seats are a bit like high-end Japanese restaurant, such as “Sanka Japanese Restaurant”. 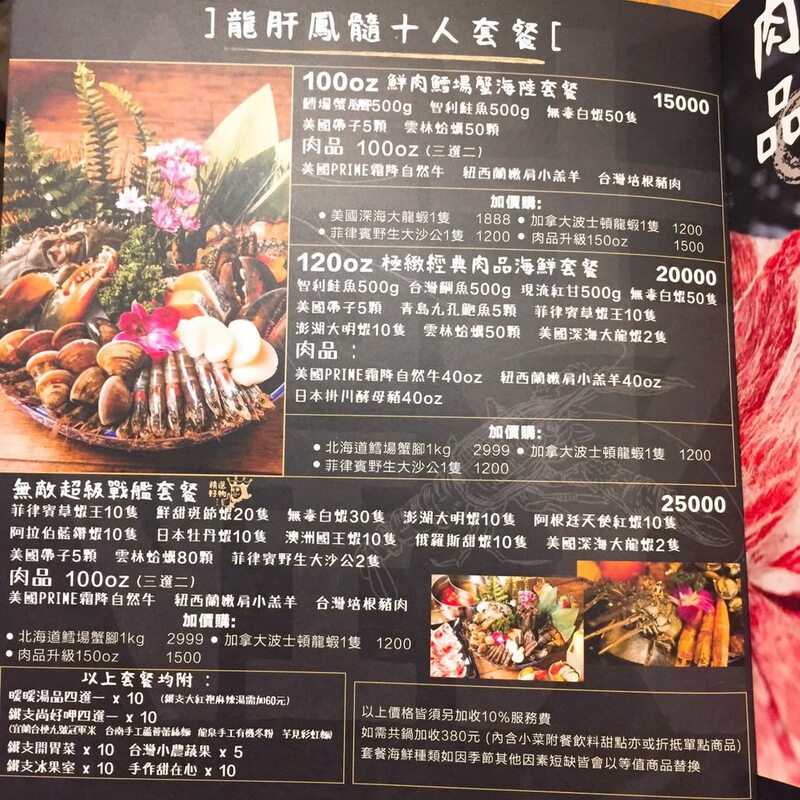 走道右側可看到用酒瓶裝飾的牆, 馬上聯想到內湖”廚子市場” 的酒瓶牆, 牆後則是有圓桌包廂, 因為當天包廂客滿, 無法照相. 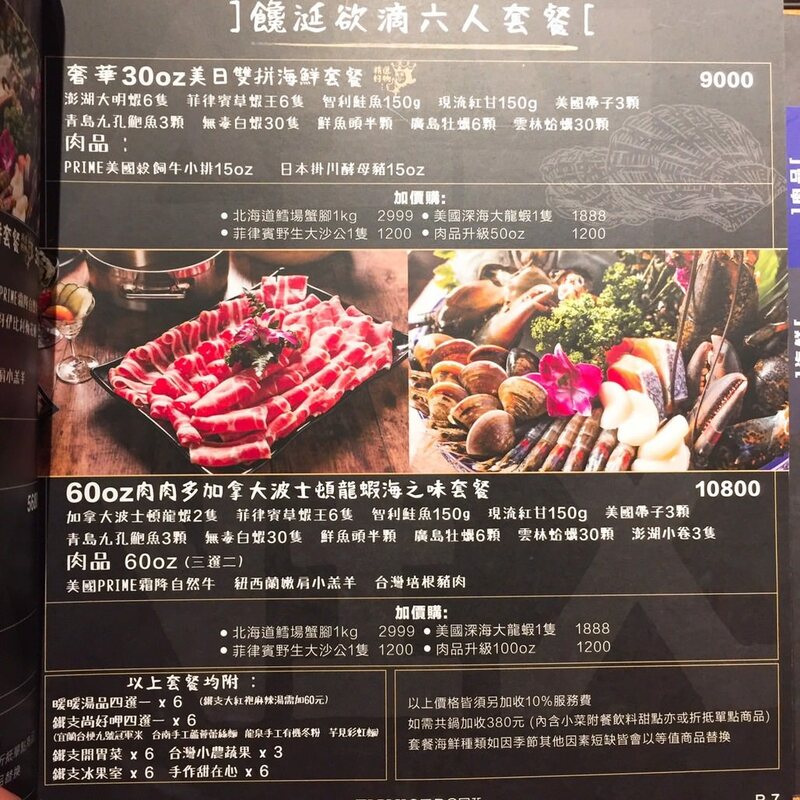 走道左側則是像 “明水然鐵板燒”的大型水族箱, 青花瓷圖騰與明亮舒適空間讓鐵支火鍋和其他暗沈氛圍火鍋店與眾不同. 入座後, 店員告知衛生紙在抽屜, 店家自製辣醬與調味料皆在桌邊, 可請店員將隨身物品放進收銀台旁的置物櫃. 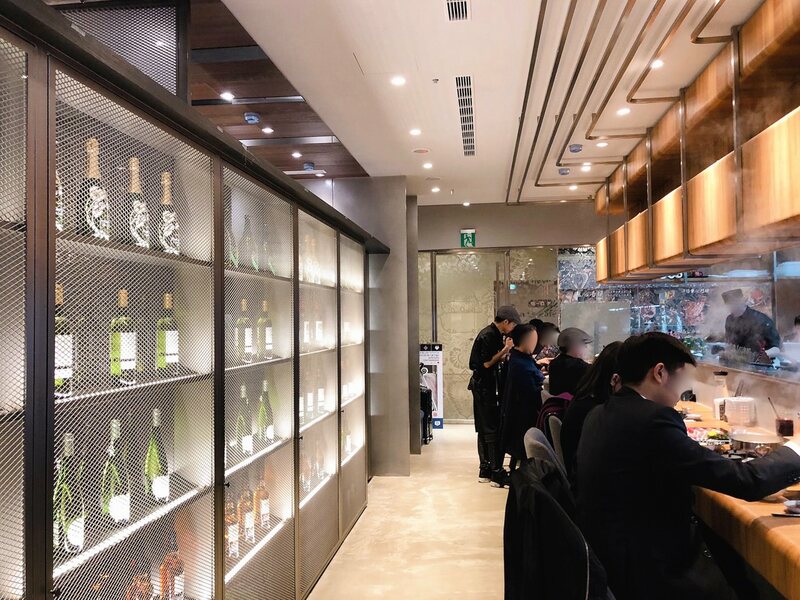 When I see the wine bottle wall, I immediately think of “Le Marché de Cuistot” at Neihu Area. Behind the wall, there are private dining rooms. 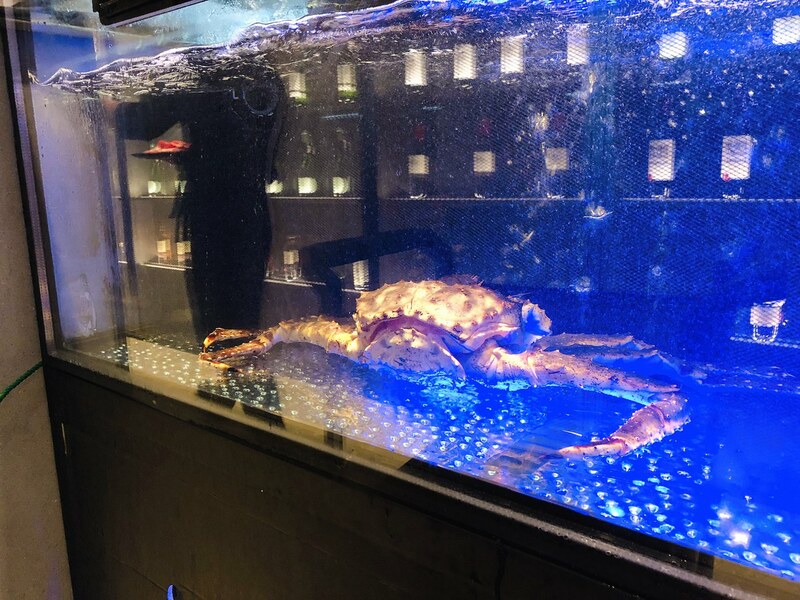 Similar with “Minsui Zen Teppanyaki” , there are several large Aquariums that contain king crab, lobster…etc. 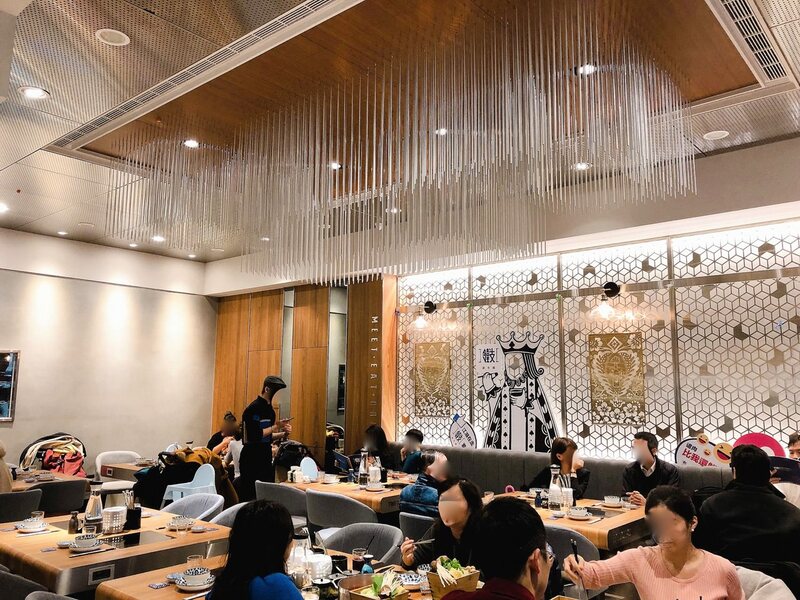 The bright and fashionable indoor design offers different type of delightful dining environment. 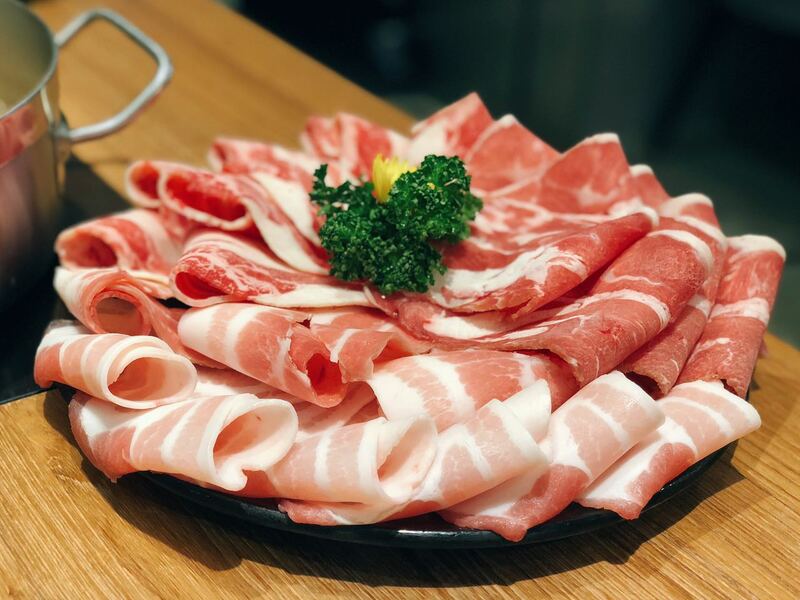 不同於 “肉多多火鍋”, 鐵支火鍋餐廳以四種獨特火鍋湯頭和高檔活體海鮮為主打, 四種火鍋湯底包括大紅袍麻辣湯, 雲林蒜香雞白湯, 法式澄清老母雞湯和小農美顏番茄湯. 朋友與我則是選大紅袍麻辣湯和雲林蒜香雞白湯, 主因是我還是比較習慣單喝澄清湯 (例如在 “豐舍B.B.R.餐廳“). 我先喝了一口乳白色的雲林蒜香雞白湯, 少許豬骨釋出的膠質與蒜香充滿口腔, 想要一喝再喝, 相當不錯. 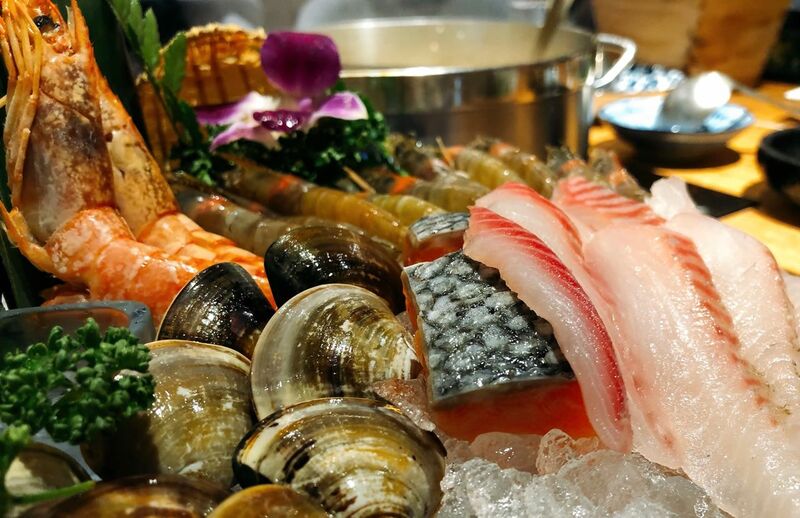 Different from “Rododo Hot Pot Restaurant”, TIGI Hot pot restaurant is famous for its hot pot broths and live seafoods. 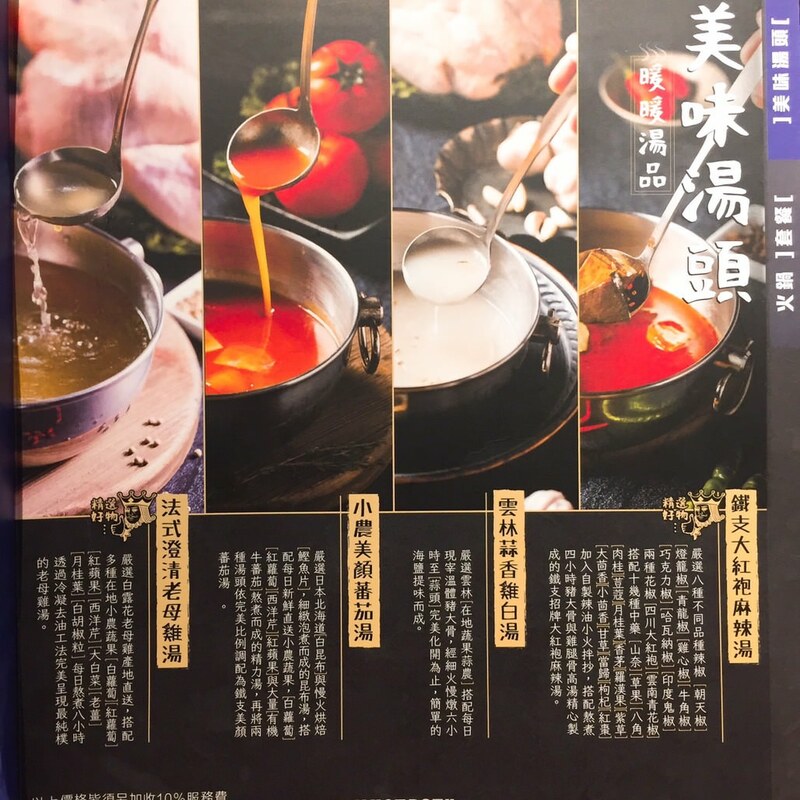 The four hot pot broths include Mala, Garlic Chicken, Consommé, and Tomato Based Soup. My friend and I tried Mala broth and Garlic Chicken Broth. 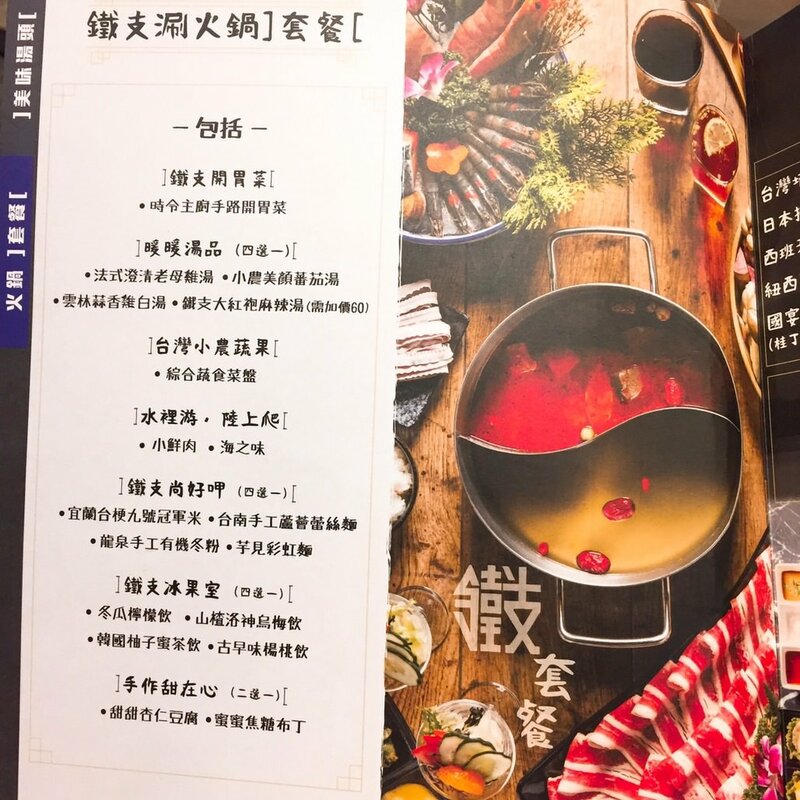 I personally prefer to drink Consommé without any other ingredients (Just like at “B.B.R Restaurant”). The garlic chicken soup indeed has fair amount of garlic flavor. 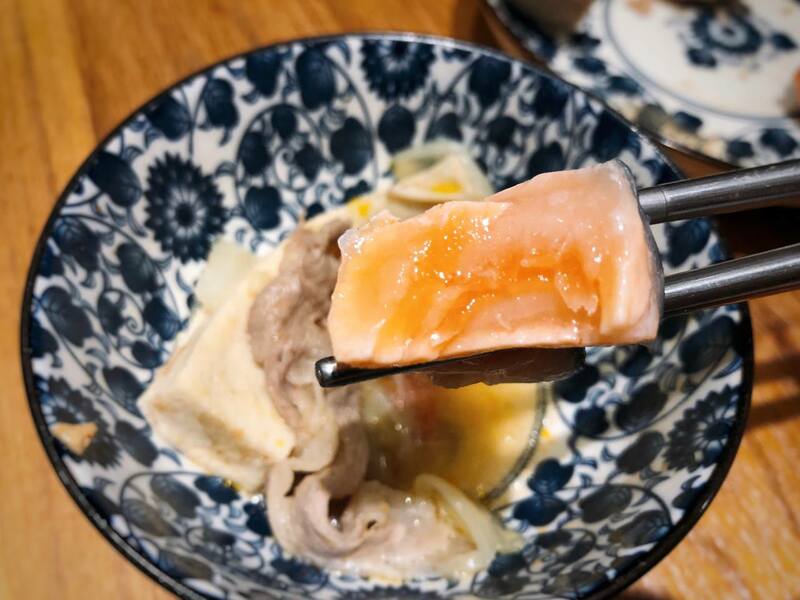 The collagen also stays at the tastebuds. 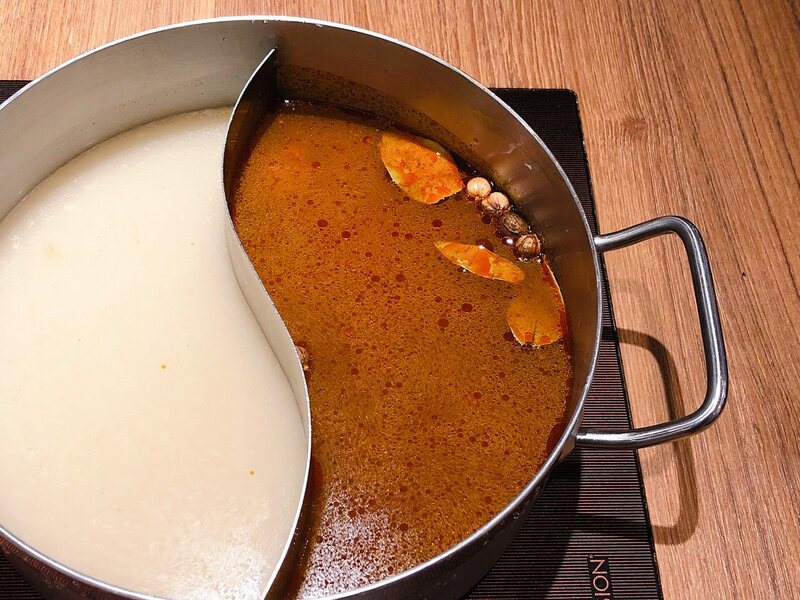 It is quite good considering it is just a hot pot broth. 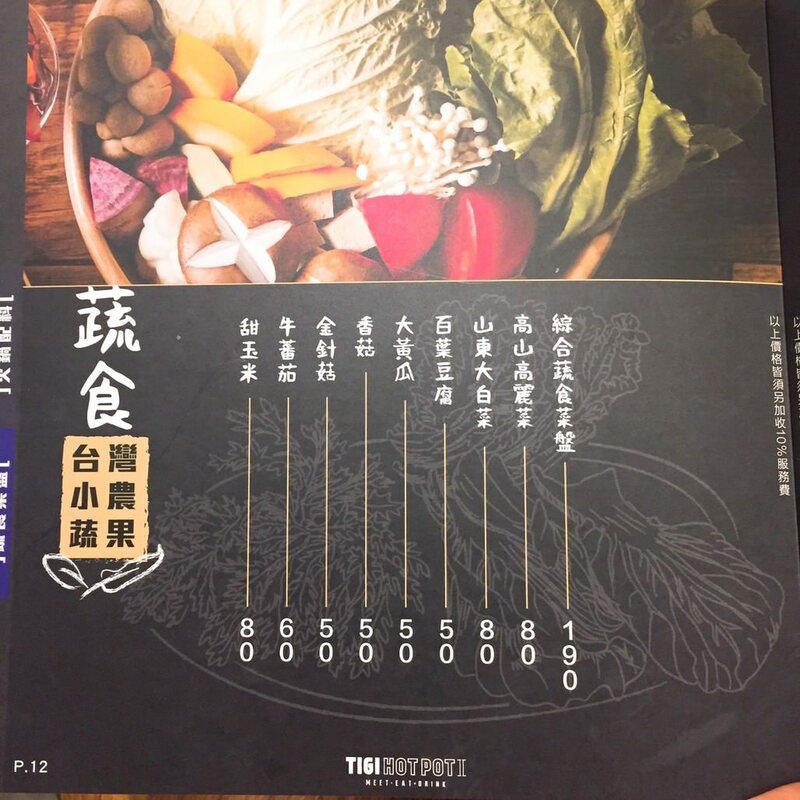 請注意大紅袍麻辣湯需另加NTD $60, 店員解釋大紅袍麻辣湯頭皆是小辣, 此款麻辣湯頭則是帶給舌尖暫時的麻痺快感, 並不會像有些火鍋店的死辣且久不退散, 也許是我對辣的包容度較低, 我個人比較喜愛短暫麻辣. 值得一提的是湯頭裡的滷鴨血與滷豆腐, 不僅口感軟嫩, 且吸收了不少滷汁與麻辣精華, 反倒跟 “詹記火鍋”鴨血和豆腐有點相似, 可惜吃完無法免費續加, 需再另外加點. 整體來說, 鐵支火鍋湯頭並非所謂的重口味, 比較適合像只吃小辣的我. Please note that there will be extra NTD $60 for Mala broth. 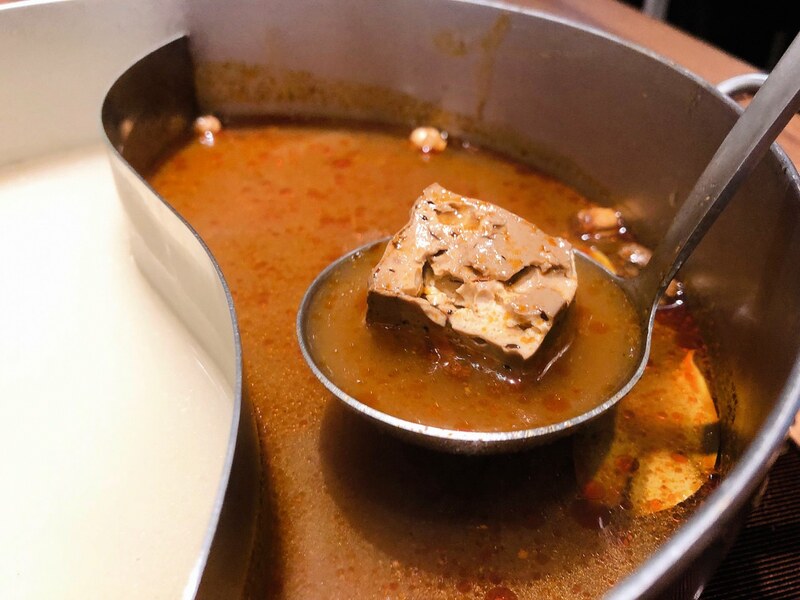 The staff mentioned that TIGI Hot Pot Mala broth only contains small amount of spiciness. Drinking the Mala broth alone, the spicy flavor only stimulates the tastebuds for a short while. I prefer the short stimulation instead of the long-lasting spicy flavor. Also, I also love their braised duck blood and tofu. However, you would need to pay extra for more duck blood and tofu. 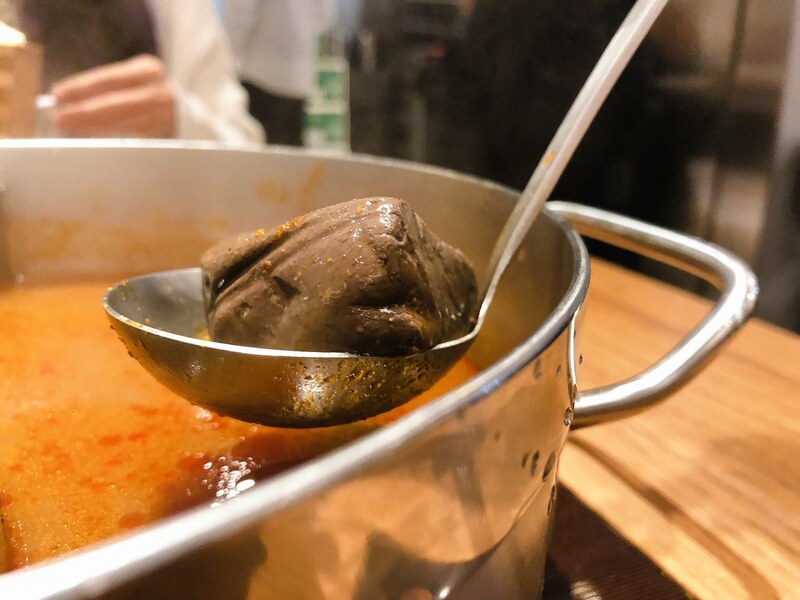 In conclusion, TIGI Hot Pot is only for people who prefer small amount of spicy flavor. 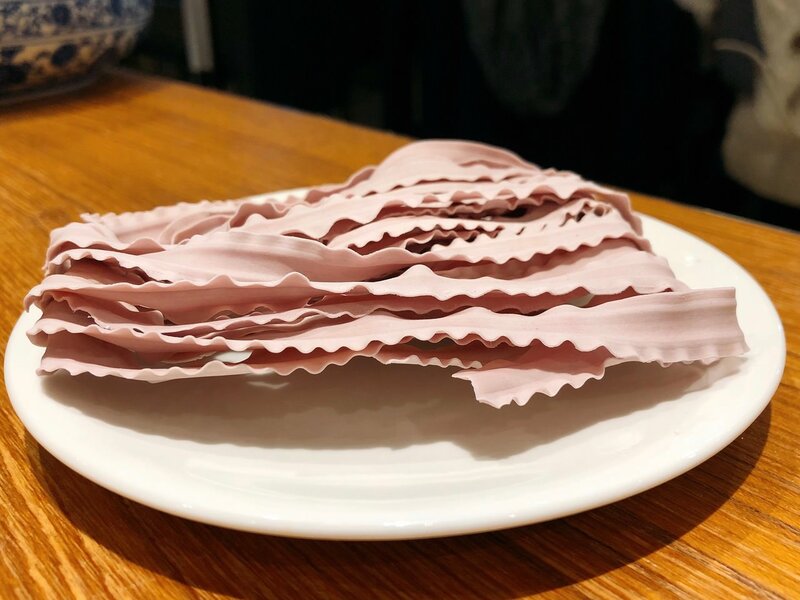 The appetizer changes regularly. The mayo did not change potato texture, which is great. However, the broccoli and corn becomes quite mushy due to the mayo. 海鮮拼盤包括阿根廷天使紅蝦2 隻, 無毒白蝦10 隻, 雲林蛤蠣 10 顆, 智利鮭魚 100g, 台灣鯛魚 100g. 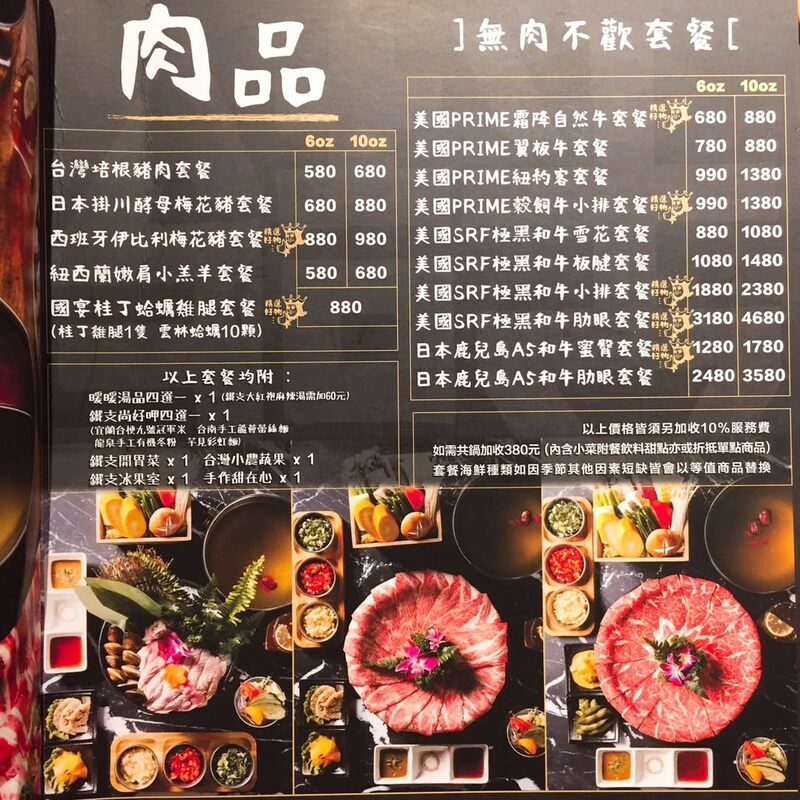 店員將海鮮拼盤端上桌, 釋放出浮誇乾冰霧氣, 在相機先食的同時, 店員提到這道海鮮拼盤最特別的是生食級智利鮭魚, 照著店員指示只涮10 秒鐘, 半熟狀態的確是最佳口感, 鮭魚意想不到地成為這道拼盤的亮點. 海鮮我都會建議不要煮太久, 而且是在不辣的湯頭涮會較適合. 若是預算足夠, 可點大水族箱裡的活體海鮮 (例如龍蝦或是北海道鱈場蟹). 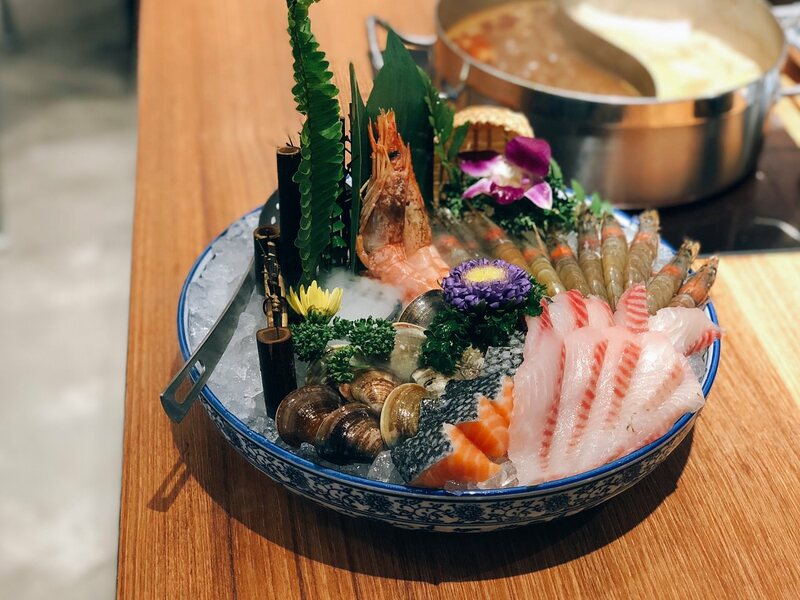 TIGI HOT POT seafood plate includes 2 Argentina red shrimps, 10 white shrimps, 10 Taiwanese calms, 100g Chili Salmon, and 100g snapper. 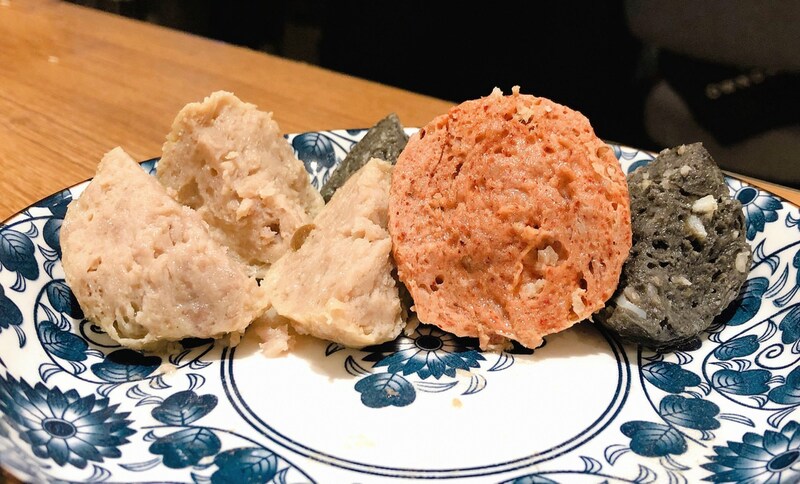 The staff mentioned that the most special item would be the Chili Salmon since you can taste it raw, just like sashimi. The salmon tastes indeed is delicious only after 10 seconds cooking. 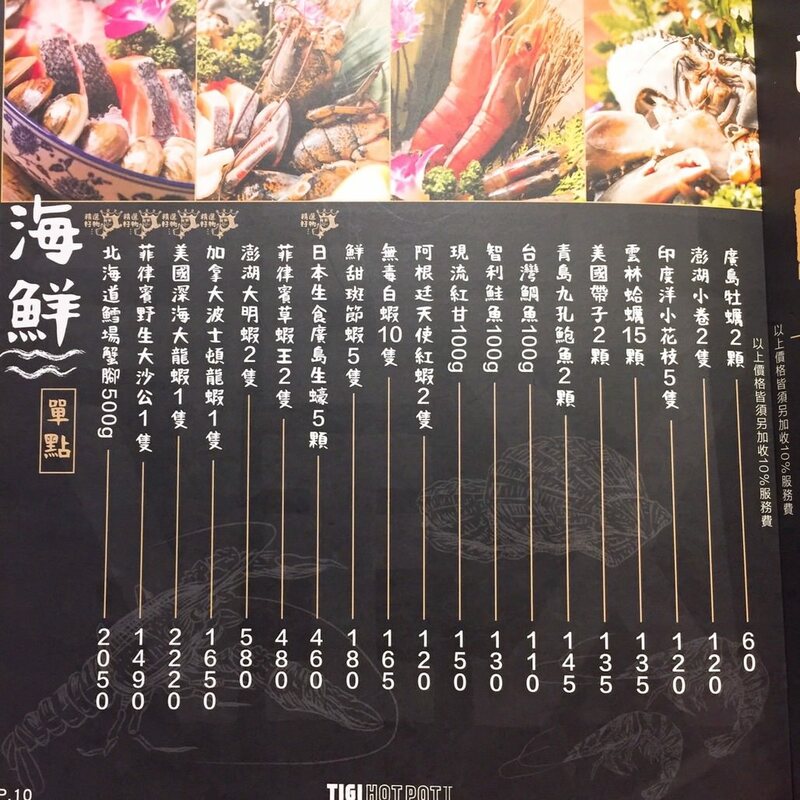 I would suggest to cook the seafood in the non-spicy broth. However, if you don’t have a budget concern, I would suggest you to order king crab or lobster from the aquariums. 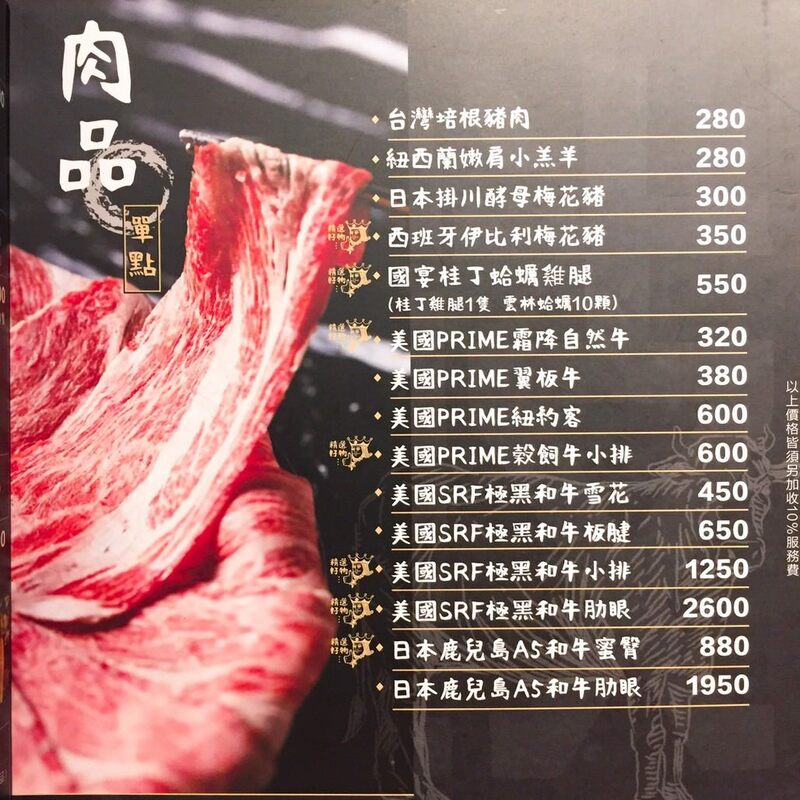 鐵支單點肉品有相當多高級肉品, 例如鹿兒島和牛或是桂丁雞, 至於鐵支火鍋極品海陸雙人套餐的肉品則是三選二, 分別是 美國 Prime 霜降自然牛, 紐西蘭嫩肩小羔羊和台灣培根豬肉. 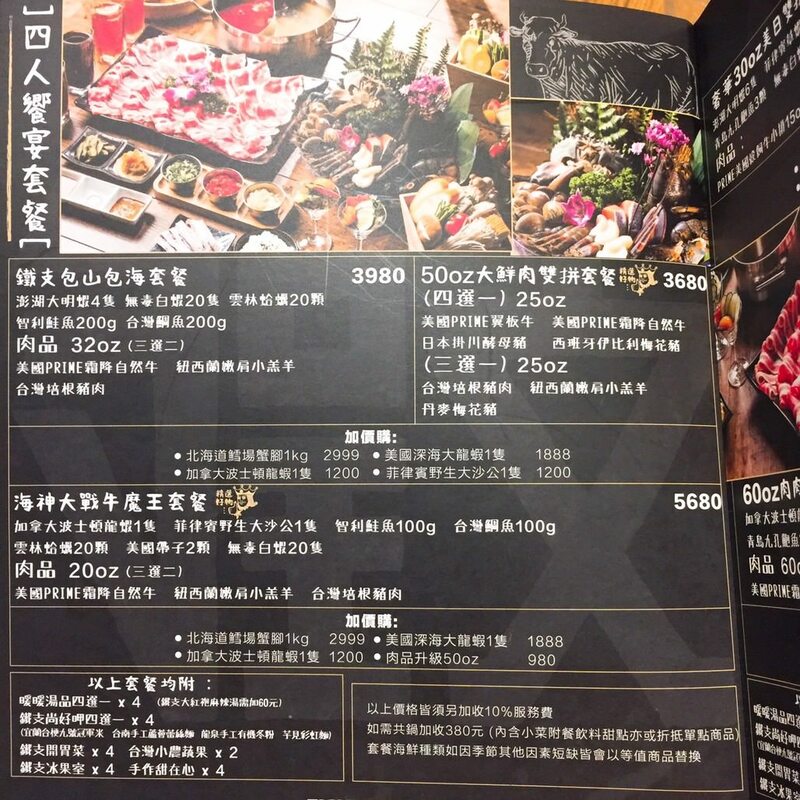 我請餐廳準備三款肉品來做比較. 視覺上每款肉片並不會過於單薄, 陸續將三款肉品涮來吃, 我個人最愛台灣培根豬肉, 固執油脂即使進了滾燙火鍋湯頭裡也不會全部消失, 入口嫩度高, 是無肉不歡的人之福音. 另一個肉品我會建議選擇美國 Prime 霜降自然牛, 除了因為幾乎在台北火鍋店吃到得幾乎都是紐澳牛肉外, 均勻且如雪花般的油脂也是考量之一. 店家也會準備少量雪花鹽和煙燻鹽給客人沾肉享用. 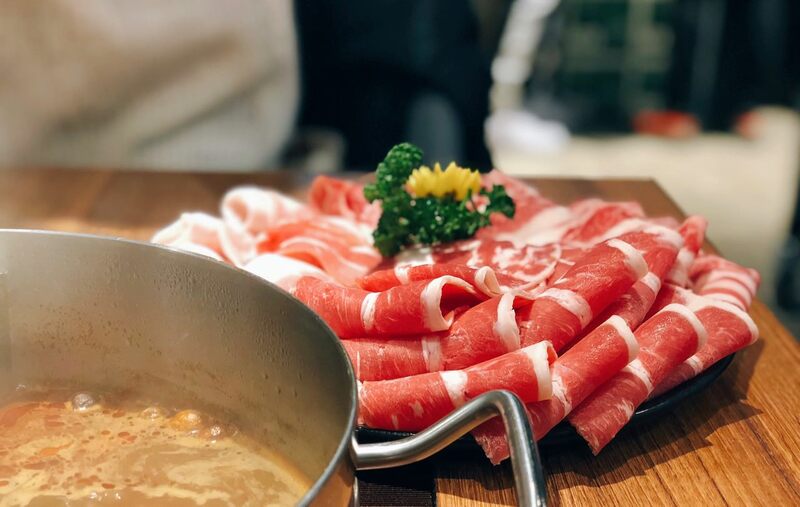 TIGI Hot Pot has lots of high-end meats, for example Waygu Beef. The customer would need to select 2 meat items out of 3 meat items. 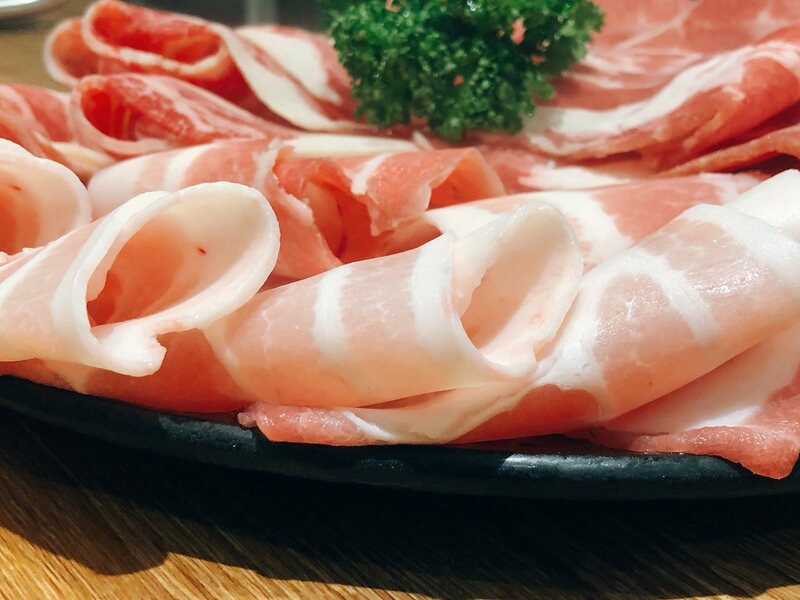 The meat items include US Prime Beef, New Zealand Lamb, and Taiwan Bacon. I personally like both Bacon and Beef. The main reason is that the bacon still remains the fats even after cooking. As for the beef, I prefer the US origin instead of New Zealand. 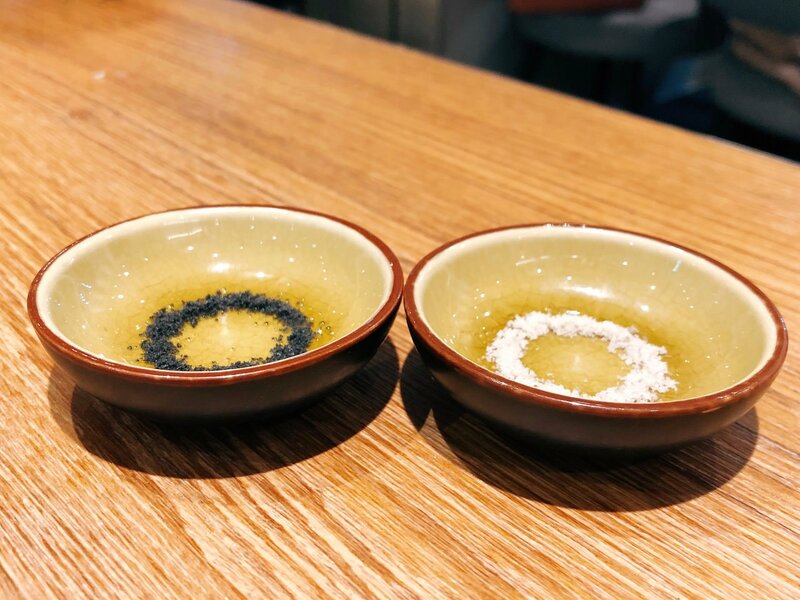 The restaurant also offer different types of salts for the meat as well. 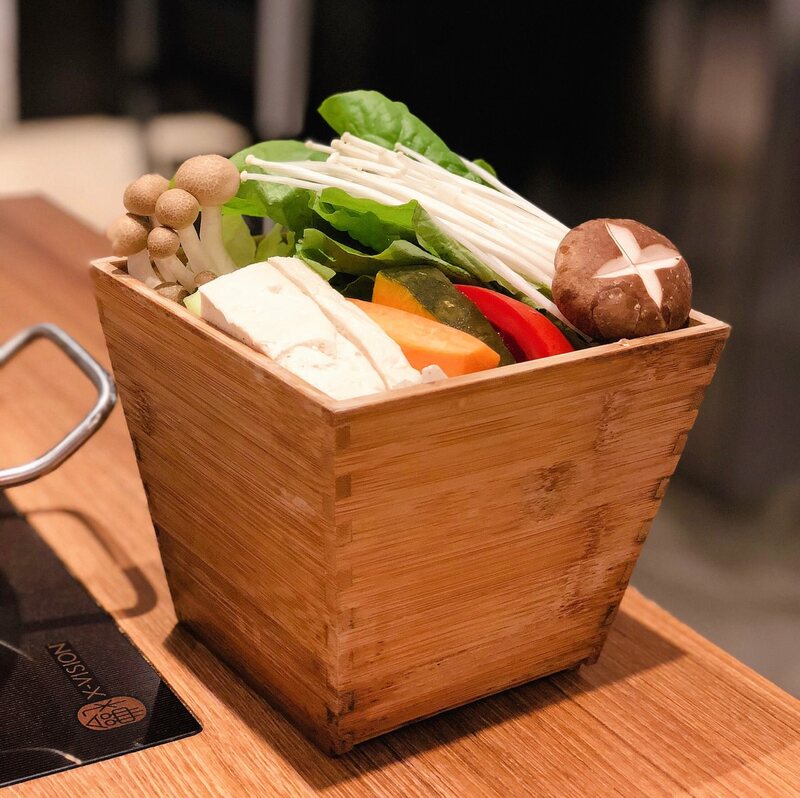 TIGI Hot Pot restaurant offers various of vegetables. 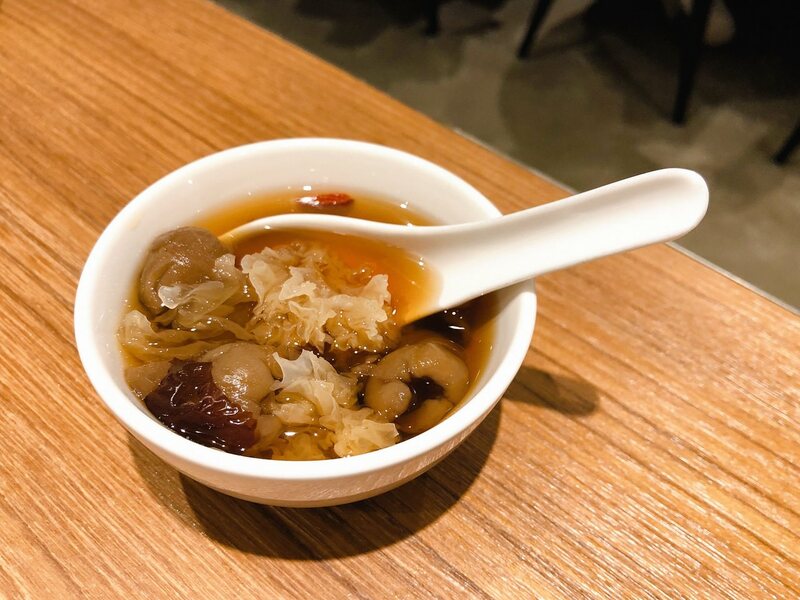 Besides the usual cabbages, the restaurant also offer tofu layers and abalone mushroom. 我必須承認我有點驚訝鐵支火鍋會標出麵食出處, 因為市面上的火鍋店幾乎都是只寫“冬粉”或”麵“, 蕾絲麵是俗稱的關廟麵, 我上次吃關廟麵是在 “饞食坊”, 我是寬麵掛, 久煮依舊Q彈相當適合煮火鍋. 芋見彩虹麵是我在火鍋店看過最特別的麵款,以芋頭取代部份麵粉為基底, 再加入天然蔬果乾燥上色, 例如粉色是用火龍果, 黃色是用薑黃, 但是因為皆有湯底風味加持, 原始風味反倒是不太明顯, 若是吃單人鍋, 我會推薦台南手工蘆薈蕾絲麵. 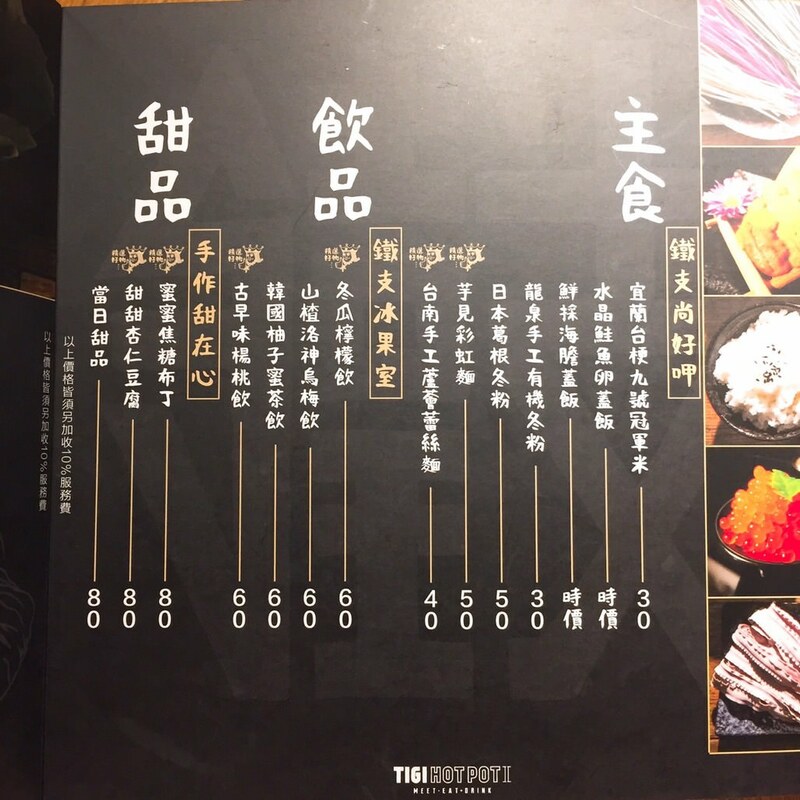 I was surprised that TIGI Hot Pot restaurant stated the origin of the noodle/rice. 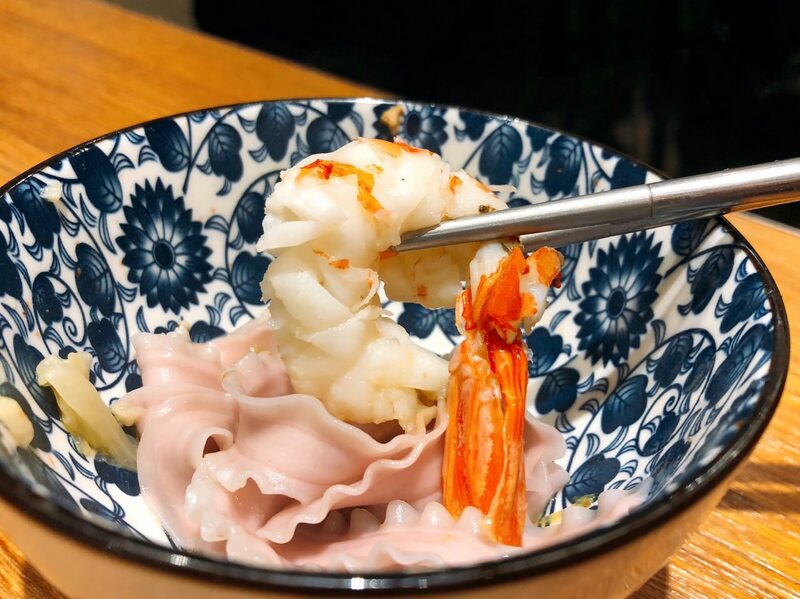 TIGI Hotpot restaurant offers thick noodle, which is my favorite. Last time I ate thick noodle is at “Zen Food restaurant”. The other noodle is thin colorful noodle. The factory uses small amount of taro powder instead of flour. 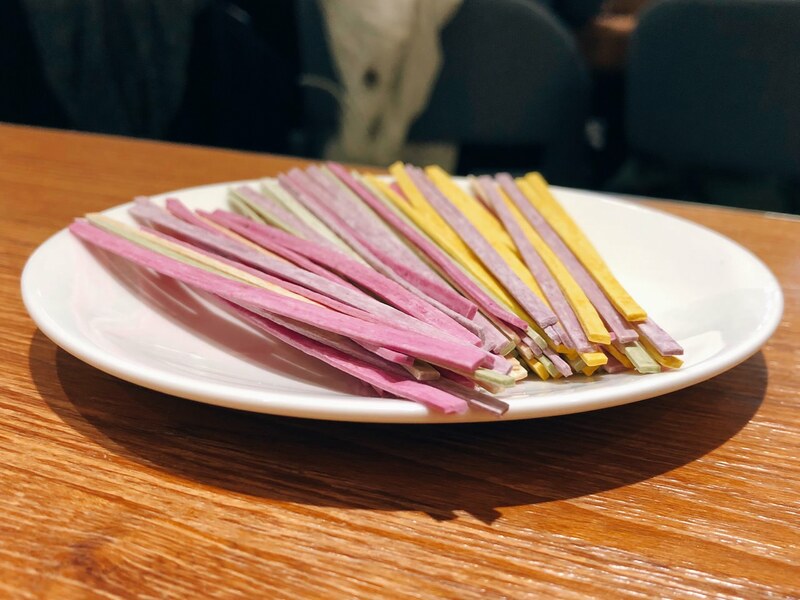 The pink color is from dragon fruit, and the yellow powder is from turmeric. However, those special flavors are lost after cooking due to the flavorful broth. I would recommend the thick noodle instead of the thin noodle. 布丁滑順搭配適量甜度, 但並不會一昧地蓋過蛋香味. 枸杞桂圓紅棗銀耳湯算是當日甜品, 並沒有在菜單上, 銀耳出乎意料地相當脆, 只是甜度已將味蕾佔領. The pudding is silky with fair amount of the sweetness. 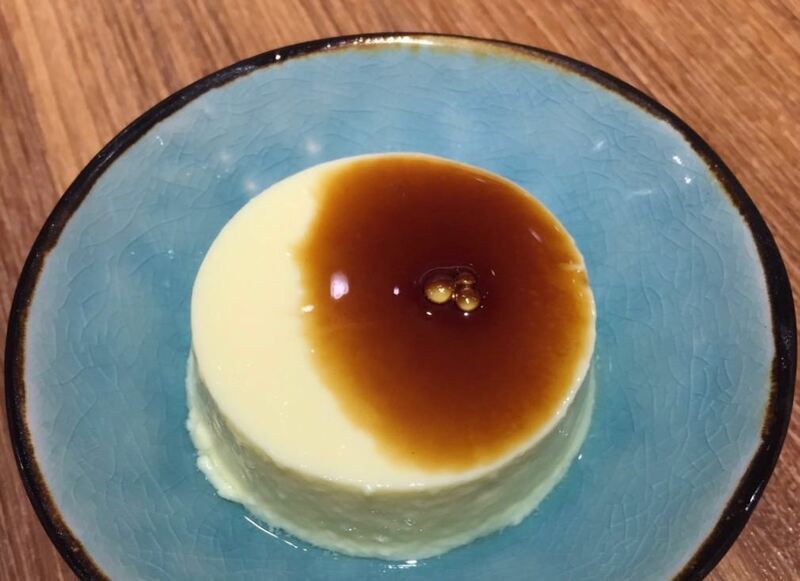 The particular Chinese dessert is daily dessert. The fungus tastes quite crisp. But, it is overall too sweet. 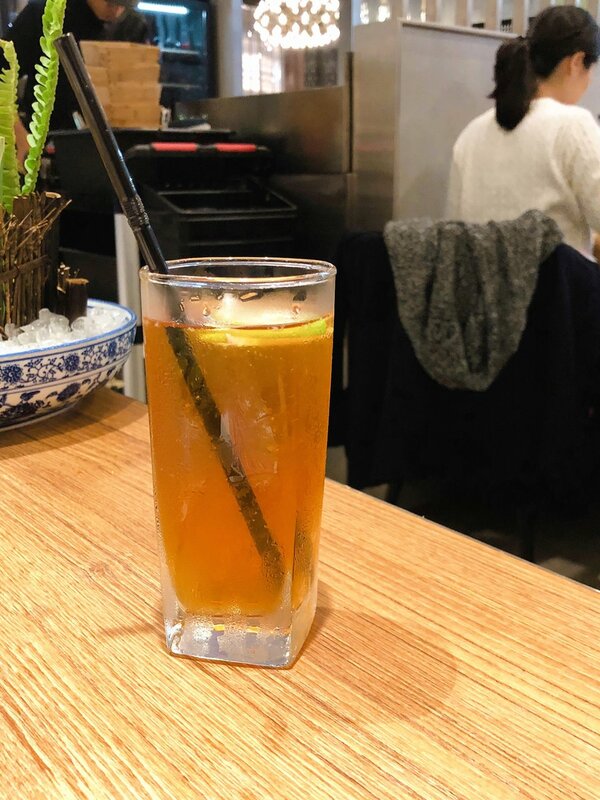 The winter melon sugar is quite sweet and covers the lemon flavor. 當你聽到蛋餃, 通常都只會想桂冠品牌, 這款單點蛋餃則是全手工, 不僅外皮蛋香四溢, 也不容易破裂, 豬肉內餡比一般商業用蛋餃更有肉香, 記得煮三分鐘左右即可. 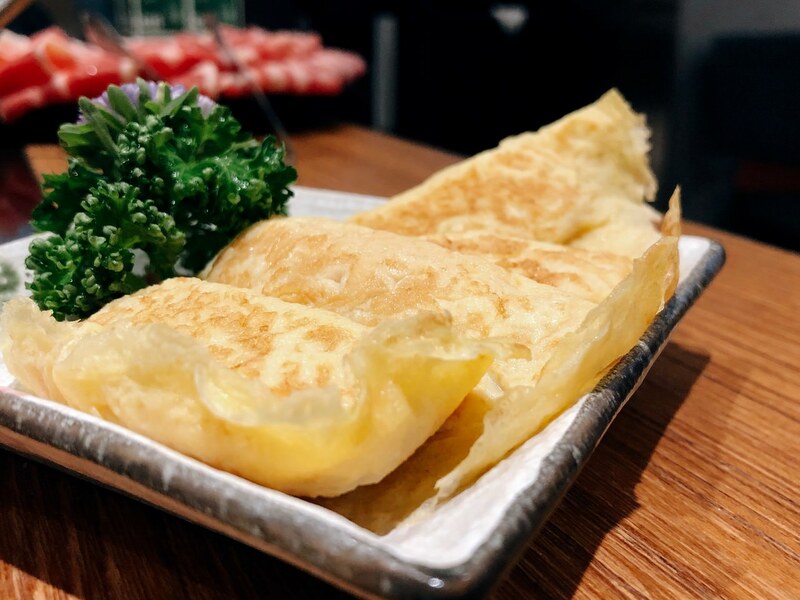 When you hear the egg dumpling, you would consider the commercial use egg dumpling. 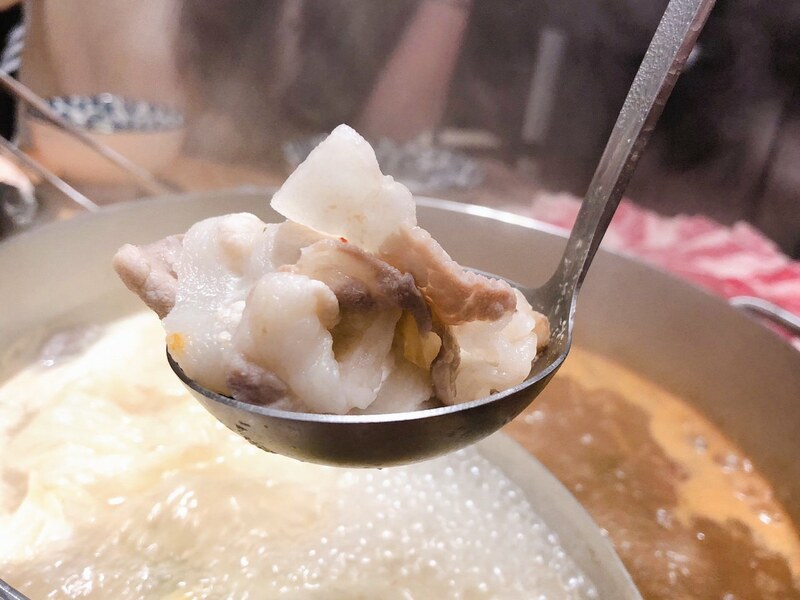 But, TIGI Hot Pot restaurant offer hand-made egg dumplings, which the filling has more meaty flavor. 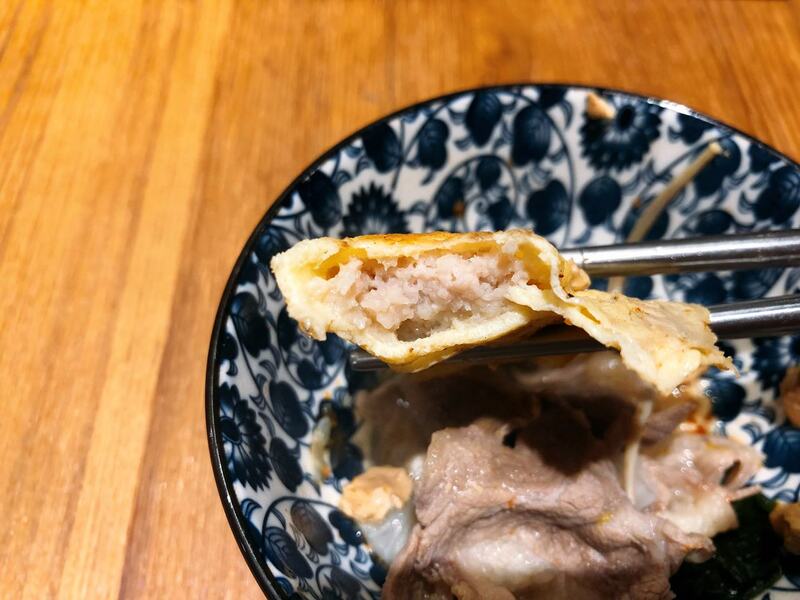 You can need to cook about three minutes for each egg dumpling. 鐵支四大天丸拼盤裡包括手工香菇貢丸, 芋頭貢丸, 墨魚貢丸和紅麴貢丸. 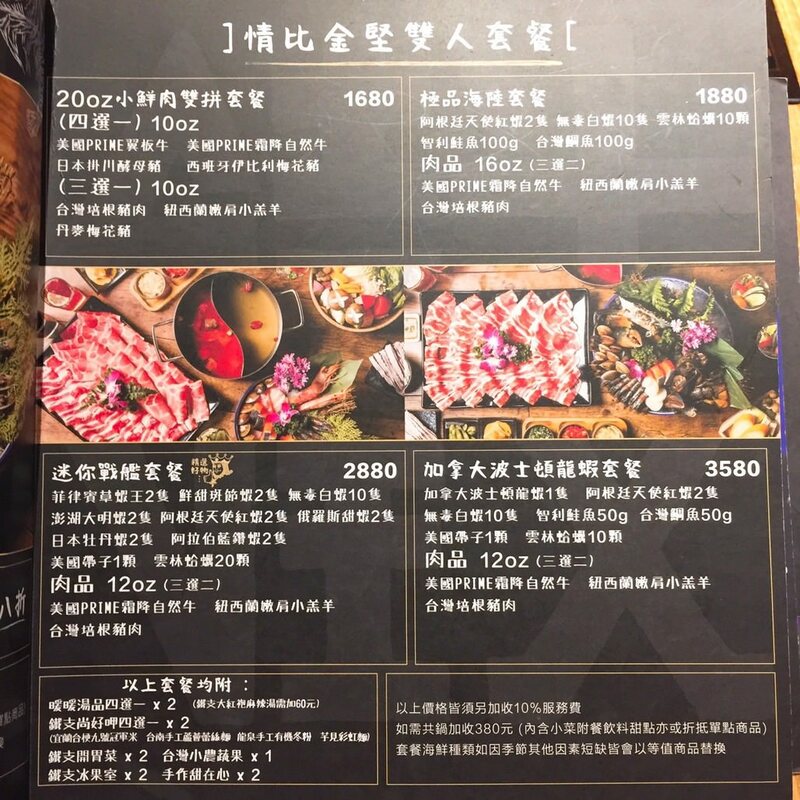 端上這道單點配料時, 店員提到若是煮好可告知請店員協助剪開, 這應該算是 “橘色火鍋”等級的專人服務. 品嚐這四款肉丸後, 我會推薦香菇貢丸和較少見的墨魚貢丸, 香菇獨特風味並沒有因為濃郁湯頭而消失, 墨魚貢丸的海鮮風味也保存得相當完整. This dish includes 4 flavors – mushroom, taro, squid and monascus (types of red color rice). 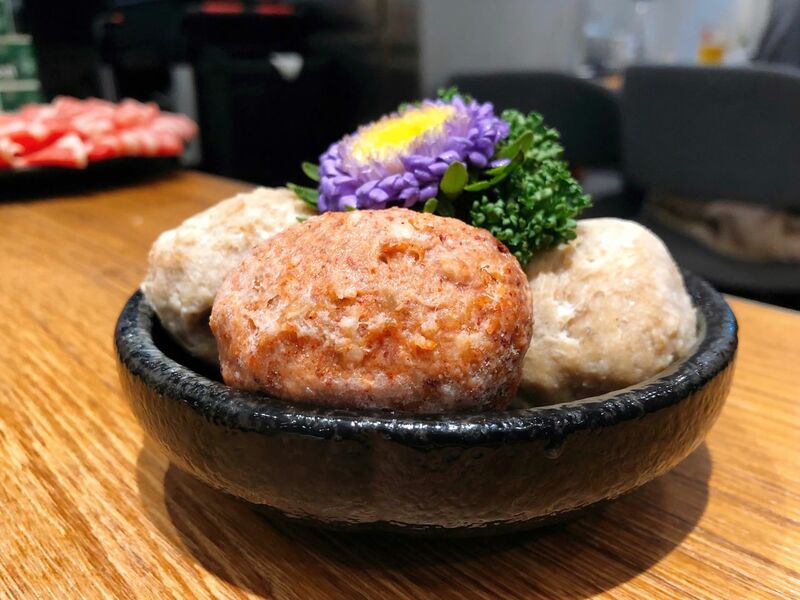 The staff mentioned that they can assist cutting the large meatball, just like the service at “Orange Shabu”. After tasting, I personally prefer the mushroom and squid meatballs. Both didn’t lose its original flavor after cooking.